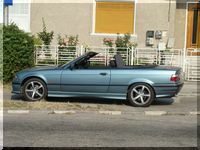 Razvan,a reader of the BMW E36 Blog, has sent me some photos of his convertible BMW E36. The car looks great and it’s very clean but I have some ideas that could make the car look even better. First, I would change the rims to something similar to this one. Also, the car looks a little bit high and looks like it needs a drop. So, this is the second thing to do. Other than these points, I think the car looks great and doesn’t need any other modifications. Take a look at the photos and let’s hear your opinions. Do you think there’s something else you baclofen online, purchase zithromax. can do to this car? This entry was posted on Thursday, September 11th, 2008 at 3:00 pm and is filed under Exterior, Photos, Tips & Tricks, Uncategorized. You can follow any responses to this entry through the RSS 2.0 feed. You can leave a response, or trackback from your own site. It is veery nice as it is, dont ‘overpimp’ it. Never liked the look of the convertible’s. dunno if it’s just me or not but they just don’t look right. they always look way to long. Nice car, juste keep it as clean as it is now. Convertible topic: About the small, black trim piece surrounding the outside of the rear window…what glue will re-attach that to the fabric? 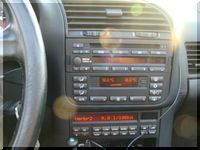 On my ’97 328i the trim is separating right where flex is and now loosening beyond that? Any suggestions? vendors? Thanks!! 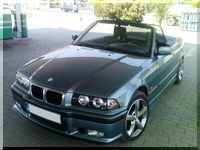 @Michael: Hi Michael, I suggest you post this question to the BMW E36 Forum instead. I’m sure you’ll get your answer there. Great car!! Looks very nice!! 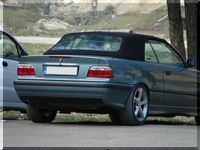 I have a BMW 318 TI Compact 96 and would change it only for a convertible model!! 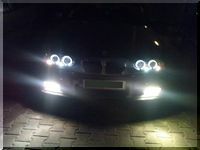 BMW of couse! 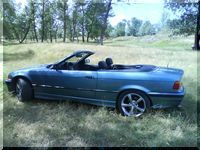 You are here : Home » Convertible BMW E36 . . . Can you make it better?